After a long, two and a half month slog of preseason, football finally returns for 2019 with the start of the third AFLW season. This season (dubbed AFLW 3.0 by AFL headquarters, something HPN will save you from here) sees two new sides join the competition – North Melbourne and Geelong. The introduction of 20% more players (and teams) to the competition has the potential to create a significant shift to the distribution of talent and the quality of different teams. Some sides have been hit harder by having top end talent poached away, while others have suffered from rival clubs stealing their talent to make up for other losses. One unlucky club (no spoilers) has faced both. All up, with delistings and new recruitment, roughly a third of the competition this year is made up of players who weren’t there last year. Both the expansion sides, Geelong and North Melbourne, embarked upon different building strategies; one focused on existing top end talent, the other going for local players. North Melbourne have put together a list filled with the competition’s existing leading lights, a collection of top end talent that would match any side over the first two years of the competition. As the headline states, it may very well be their competition to lose. On the other hand, and assisted by a special exclusive recruiting zone, Geelong focused on players from Geelong and the western side of Melbourne, bolstered by a select number of AFLW veterans. At a broad, superficial level, the approaches seem to ape that of the Gold Coast (North) and GWS (Geelong) when they entered the AFLM competiton – albeit with vastly different competitive stakes. Both sides should immediately be competitive, and if all things break right, both may have shots at the finals. 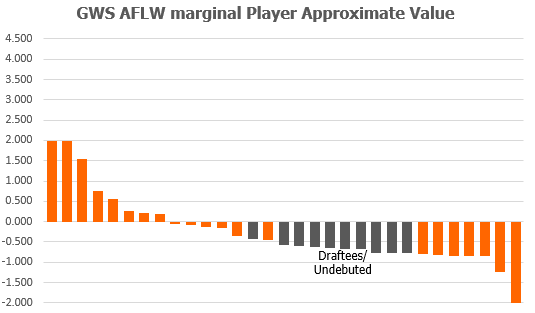 The other teams can reap a significant upside if they get plenty out of their hitherto unknown new players, many of whom have come from high level VFLW competition and are not the raw, overmatched, 18 year old recruits typical of the men’s AFL. How strong will each team be? 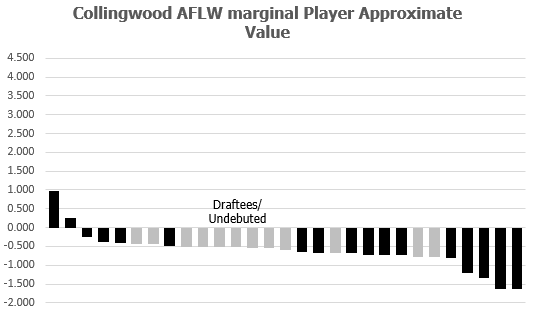 HPN has taken its marginal Player Approximate Value (mPAV) measure, employed in previous years, to try to make sense of the numerous player movements and to estimate potential values for the new draftees at each club. To come up with these ratings, HPN has taken the mPAV values of players in previous years, and created an estimated list value. For new players, HPN modeled a “draft round value chart”, similar to our AFLM one – just with a lot less data, based solely on the performance of first year players after the 2017 draft. There are a select number of players that don’t fit either category, and HPN will mention them specifically below. It’s also a pretty basic fact that clubs will not get to field their best 21 every week, or perhaps ever. But the best players to tend to play more. 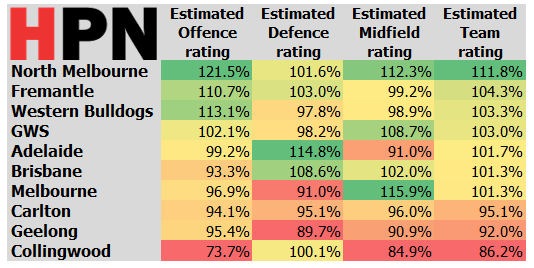 As a result, to estimate team strengths, HPN derived an “expected games” factor to apply to each player, based on the real world performance from the 2018 AFLW season. In our player-based team ratings, the top player is expected to play 6.5 games and therefore contribute about 92% of the time, while the 15th ranked player gets 5.2 games, and the 30th, 1.6 games. This spread of games can help account for depth at clubs. HPN has also considered the known season-long absences for players. Finally, HPN adjusted these outcomes to fit the overarching system. The mPAV and PAV ratings work longitudinally, there is a fixed sum of total value in the system per team in every season. Since more established talent leaves the league than enters it this year (including injury forced absences), we scaled the remaining values in a uniform manner. North Melbourne look very strong but not prohibitively dominant, thanks to their poaching of established players. Fremantle, the Bulldogs and GWS are slightly ahead in a six team chasing pack. Carlton and Geelong are further adrift (Geelong with an asterisk as you’ll see below), and Collingwood look to be in serious trouble. The long version is below, in a club by club look. First, though,let’s look at how the conference system may affect the competition. Overall the conferences are unbalanced – the three apparently weakest teams are in Conference A so Brisbane and GWS have the inside running on the two semi-finals spot, while every team in conference B is probably a contender for the second semi final spot behind presumptive favourites North Melbourne. Within group B, Geelong and Brisbane have an edge by not playing North Melbourne when the other teams are evenly matched. Conversely, Melbourne is the only side in pool A who plays both Brisbane and GWS, the likely two strongest teams in pool B. In such a short season, fixture imbalance may matter more than in the 22 game AFLM season. As we stated above, draftees are a big piece of the team rating puzzle, and it’s a huge unknown just how much they’ll shape the 2019 season. Some clubs like Geelong and Collingwood will depend very heavily on their new recruits. However, our ratings suggest that pretty much every club should find that at least a half dozen of their new players are among their best-21, pushing out previously established players. How have HPN determined that draftees should make this big an impact? 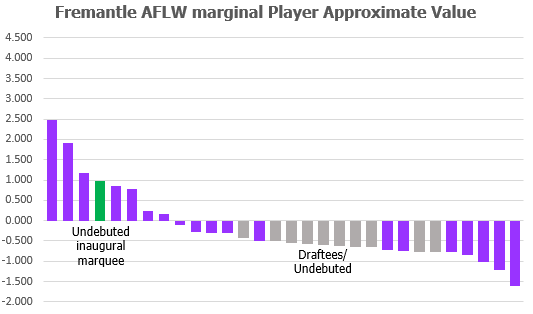 It turns out that, unlike in the men’s competition, the better draftees in the AFLW sit above replacement level, inside the best 21 at many clubs. When we isolate the performance of last year’s first round picks, we see that their trend line value of -0.425 mPAV places them between 6th and 14th within every existing list. Furthermore, nearly the entire of last year’s draft class contributed at above replacement level. This year’s crop is meant to be even better than last years, to add complexity to the projection task. The high level of impact is partly just a numbers game, since smaller lists, the high turnover inherent to semi-professionals, and this year’s expansion, have all led to most clubs barely having 21 established players to fill out a team. 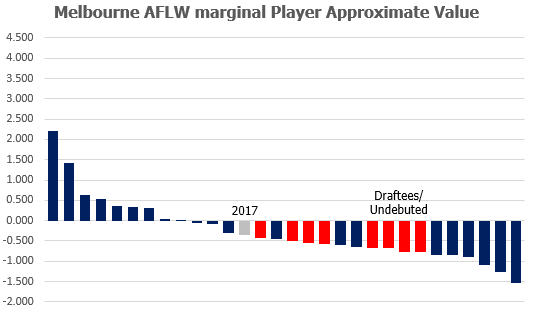 But the new recruits’ impact is also due to the nature of the AFLW recruiting pool. There’s still quality mature age talent not playing in the AFLW, waiting to be drafted. And the teenagers are getting better fast – development pathways created in the last few years are steadily increasing the standard at which draft-age teenagers arrive. At this point, the more significant factor is still probably the multitude of mature aged players and a few cross-code converts coming into the comp, but we suspect the teenagers will probably take over as the main driver pretty soon. Overall though, the biggest caveat on our ratings is this: If the new draft class are systematically better than the last one on which we’ve based their valuations, then all the teams with a heavy reliance on draftees should also be better than projected here. The Crows have lost a few valuable players from last year’s campaign. Ruth Wallace and Sarah Allen are inactive this year and Rhiannon Metcalfe’s year is over with an ACL. Those were all top ten players for the Crows, and so they’ll need a little more from their draftees than some of the more settled sides. On the flipside, both Erin Phillips and Courtney Cramey (rated 2nd and 4th here) had shortened and hampered seasons last year, and would likely improve on these ratings with full and fit seasons. Phillips in 2017 was the year’s best player and significantly better than shown here. Their defence was their biggest strength last year and with little change in that part of the ground save for Talia Radan’s move to Melbourne, their list’s mPAV still suggests they’ll be the toughest side to score against. The Lions get quality defender Sam Virgo back after she missed 2018, and despite losses of personnel they retain a very good top ten. 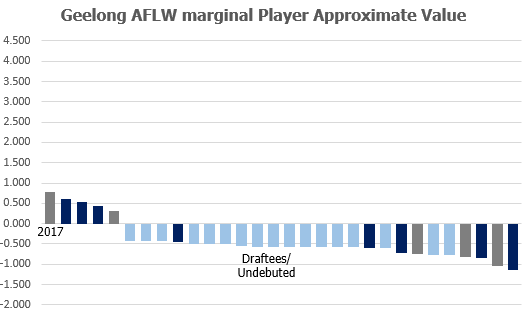 Lauren Arnell had a poor 2018 but comes highly rated as former Blues captain, and may outperform her middling rating. The two-time grand finalists will, however, need to hope the Queensland draftee production line bolsters them because Gibson, Stanton, Randall (all lost to North Melbourne) were top ten Lions players in 2018 and Ashmore (also to North) was also valuable. Small forward Sophie Conway’s season ending injury compounds their biggest issue, which has been scoring, and they now look like the second weakest side in terms of offensive power. 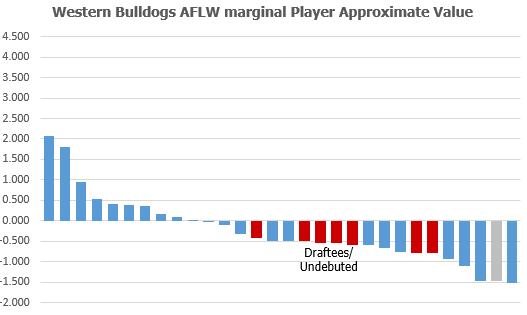 Last year’s wooden spooners were weak enough that the injection of a good number of early round draftees should by itself improve them, but they also lost some decent and mid level players to make things more difficult. Maddy Gay (Melbourne) and Danielle Hardiman (North) were top ten players on 2018 form, and while former captain Lauren Arnell had down year she is still potentially a star and is now at Brisbane. The biggest acquisition is a desperately needed midfielder in Amelia Barden, who was a top ten 2018 Collingwood player and could be top five at the Blues. 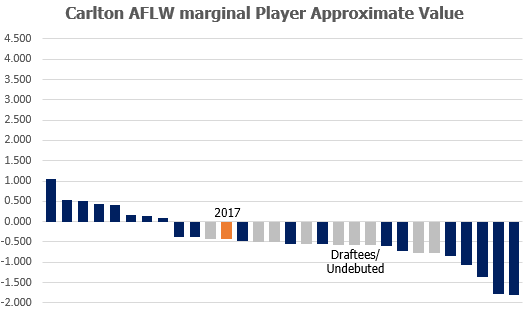 Kirby Bentley didn’t play in 2018 and was picked up after Fremantle delisted her, and she could be in the top half of Carlton’s best 22 on her 2017 numbers. Briana Davey is the third column in Carlton’s chart here. She played 2 games with one ended by an ACL injury, and if healthy should easily outperform this mark. Overall though, any change will have to come out of the blue, so to speak. There’s just not a lot of promise in the existing numbers. The Pies could be a long way back, unless their recruits, teenagers and mature VFLW players, shine immediately. They climbed off the canvass to win 3 of their last 4 last season, but now they’ve lost 8 of their best 10 players from then. Four players (Moana Hope, Jess Duffin, Emma King and Jasmine Garner) went to North Melbourne, two went to other clubs (Christina Bernardi to GWS and Amelia Barden to Carlton). Christina Edwards retired, and Chloe Molloy will miss the season with injury. The offence looks particularly impacted, with nearly everyone who contributed meaningfully up forward last year no longer at the club. That leaves Steph Chiocci and Jamie Lambert as the sole above-0 mPAV players from last year, and their first round draft picks Jordyn Allen and Katie Lynch are rated 6th and 7th at the club, based on last year’s draftee form. If any AFLW team is in rebuild mode, it’s Collingwood. How have 7th placed Fremantle, who missed the wooden spoon purely by beating Carlton at the end of the 2018 season, moved to being the 2nd strongest rate team in 2018? It is simple: stability. Last year the Dockers were only slightly off the middle pack, and with the losses that have befallen most other established sides, Fremantle made up a lot of ground just by staying still. Freo basically retain their talent and experience, their only losses being Briana Green’s season ending injury and the delisting of a couple of seemingly worthwhile players (especially Lisa Webb, who had a valuable 2018 but at age 34 has moved into coaching). They’re also likely to be be strongly bolstered by Kiara Bowers, shown in our chart in green. She was a foundation marquee player and therefore considered one of the best footballers in the country. With two years out of the game she lacks any data to value her on, so we’ve valued her using the average of the 2018 seasons of the other 15 foundation marquees. They may also get more from Kellie Gibson than we’ve projected. She was injured most of last year but still is the 2nd highest rated Docker in this chart. More than any other side, the Cats’ rating comes with an asterisk, dependent as it is on new recruits and a number of players who didn’t play in 2018. All those light blue columns are modelled based on the 2017 draft class’ performance in 2018. Their top rated player here is Jordan Ivey off a small sample size. She played 2 games in 2017 for Carlton but was delisted at the end of the year, but those two games seem to have been pretty good. She then injured her ACL before the 2018 season. Fellow 2017 delistee Hayley Travean rates 5th, bookending their star pickups from other clubs of Phoebe McWilliams, Aasta O’Connor and Richelle (Rocky) Cranston. 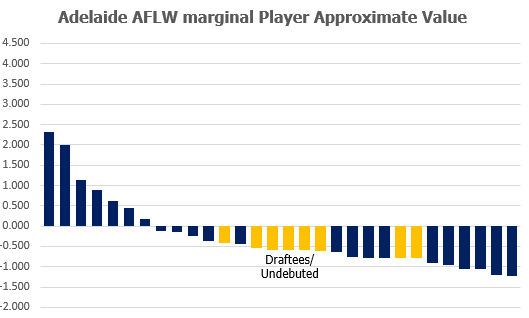 Several draftees rate ahead of Melissa Hickey, then following them it’s a big stack of midrange recruits, many of whom are direct concessional pre-listings from their own VFLW side, players we’ve rated here as 4th round (midpoint) draftees. Two thirds of the Geelong list played in their VFLW side last year, a team which finished 4th playing against scatted AFLW talents. As noted in our explainer above, we’re valuing new players based on 2018 debutant draftees, but it’s entirely possible that the alchemy of spending a year in Geelong’s system gaining experience and building a rapport, may make many of their teenage and mature recruits better than the cohort of last year’s draftees. Time will tell, and our ratings are what they are, but readers are invited to consider Geelong a bit of a mystery compared to other teams. GWS didn’t get away from expansion unscathed but like Fremantle, they benefit from stability and the depth of established players that brings. Britt Tully (absent for the season) and Renee Forth (Adelaide) are mid level hits to a midfield that retains its quartet of stars (Gum, Eva, Farugia and Dal Pos). Their sole major loss is Phoebe McWilliams to North, blunting their key forward stocks. The forwardline will, however, benefit significantly from the recruitment of Christina Bernardi, a smaller forward, who was the Pies’ best player last year. If stability will benefit Fremantle, it should also give GWS a boost too. The Dees took a hit to their playing stocks at the hands of Geelong. They still sit within the chasing pack, albeit fractionally at the foot of it. Their midfield rates as the strongest in the comp but should be less overpowering without Daisy Pearce, who is out this season due to her pregnancy. The loss of Richelle Cranston (Geelong) blunts the Dees up forward, and their defence is poorly rated according to mPAV. 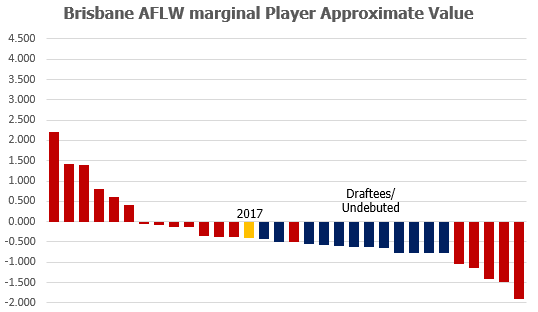 It shapes as the second weakest in the league, with Anna Teague and Melissa Hickey (Geelong) and Laura Duryea (delisted) key figures last year and now missing from an already shaky looking setup. Talia Radan from Adelaide should help a bit. The Dees as noted above also are the only side in their conference to play both GWS and Brisbane, which could hurt them in a close finals race in Conference B. 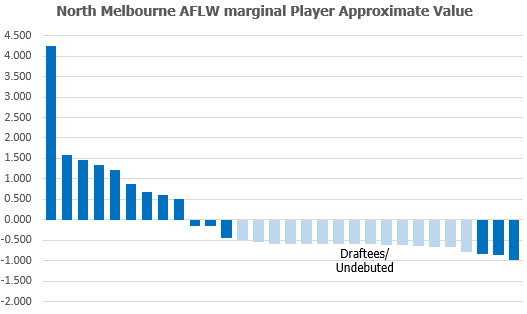 Our mPAV measure had Emma Kearney comfortably the best player last season, and now she’s at North Melbourne, stretching the vertical scale we needed to use to keep these charts consistent. North’s top ten, poached from other clubs, is formidable – Emma Kearney, Emma King, Jasmine Garner, Moana Hope, Brittany Gibson, Jamie Stanton, Tahlia Randall, Jess Duffin and Jenna Bruton. It is particularly strong offensively and supported by a pretty decent looking midfield as well. The team is a list of two halves, because beyond the top ten they are pretty much entirely draftees and other new recruits pre-listed from the VFLW. As such they should still be as vulnerable as anyone in parts of the ground. The defence in particular looks merely average and some of the other probable top sides, like GWS, may actually prove to have more genuine depth even with less cream at the top. The other question is how much the level of output of players formerly at different sides, can be replicated in a single side. There are several forward and midfield guns in this group, and they can’t all kick the same goals or hit the same clearances, so it’s quite possible that there will be a form of diminishing returns where several of these players find reduced roles and correspondingly lower individual impact. Or, perhaps, this is an underestimate and the sum will prove greater than the parts, and North Melbourne will dominate to the extent it leads to the AFL crippling the expansion rules for all teams to follow. It could happen. Last year’s premiers take a big hit with the loss of the league’s best plater Emma Kearney, as well as top 10 Dogs Aasta O’Connor (Geelong) and Jenna Bruton (North) knocking them from last year’s most dominant side down to merely a pretty good one. They have picked up a useful defender in Belinda Smith from Fremantle who will slot in there. Isabel Huntington (a flat line in the chart here) was injured eartly in her second game last year and should outperform this rating, improving the Dogs further. We haven’t made quantitative predictions in this post, but we feel pretty confident saying GWS and Brisbane are the most likely semifinalists from Conference A (and GWS the more likely minor premier), with Geelong rated a long way off but clearly the biggest unknown in the competition. In pool B, North really do look like the presumptive minor premier assuming their top 10 players even halfway gel together. That should leave every other Conference B team fighting for second, a fight we’re quietly backing Freo to win with their softer draw and higher rated and unpillaged team. Previous Post:2018 AFL Draft – did your club grab sliders or bolters?